Organizing a poolside event or having games in a swimming pool is good to set a mood at home. There are wonderful ideas in festive options for your pool side decor and much to do inside your pool. Right from seating arrangements to festive lights the best things can happen to your pool as per the event. Climatic conditions do affect your pool and suitably you can think of a cleaning option. The effective water heaters are the best way you can do a pool activity even when the weather is a bit cold. Expressive lighting and patio heaters add the much need light to any party. There are certain party decor you can look up on a hire basis that adds so much of utility to your decor. Budgeted ideas for a pool side come with the many discounts you can see during a festive offer. Looking for seating arrangements, you can set up a line of casual cushioned chaise chairs or again look for simple couches that are in wicker finish. A light-weight seating arrangement is the best so that you can move it and rearrange so that your pool side gets a new look each time. Party ideas include several water games and you can invest in volleyball nets and look for other hand ball games. Pool care is possible with solar covers and special nets that shield the pool from hasty evaporation. Water purifies like chlorine come in tablet and powder form. Using a lot of inflatable seaters in your pool is the perfect way to relax. Get some more luxury in your patio with moving carts, umbrellas and a BBQ corner. This is good for parties and for family gatherings. Rugs on the sides of the pool floor and an exclusive slipper stand for flip flops are great for summer time. Day time events in the pool side are exciting for a ladies party or a simple birthday celebration of your toddler. Garden decoration can be done in thematic way. It is so easy to get some ideas from the trends that are followed. Maintenance of garden furniture has to be done regularly. For extravagant patio furniture there are exclusive styles that are invented by leading designers. 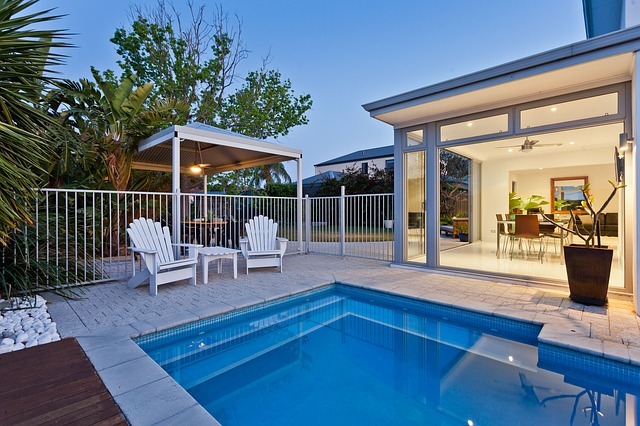 Getting a more party atmosphere is about good lighting for your swimming pool. The options are many and the newest ones come with power saving technology. Get some artistic ones in the vintage styles that does so much of goodness to your backyard. Customized furniture for storing your cleaning equipment’s is really easy. You can shop for the same to keep your vacuum, pump, cleaning agents and sprays. Pool care is vital and you can look for best portable pool vacuum in your area. Combine other facilities like sprucing up your patio along with pool maintenance is a good idea. Spa pools though small require a lot of attention as the usage is more. A colorful inflatable boat seems great to float along the length of your swimming pool. There is an exciting range in showers to be installed beside your pool. A Jacuzzi corner in your pool is the best way to get a luxurious feel.